Locks up more times than ever...always a gamble if I am going to be able to watch downloads. 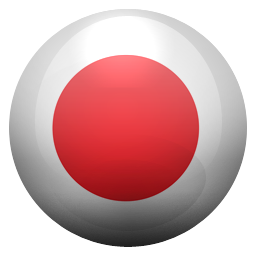 I love this app and the series American Gods, keep the work...love it. Doesn’t it seem a bit racist to have a “Black Cinema”? Why not a Hispanic Cinema? Or Japanese? I bet if if it was a “White Cinema” there would be a protest walking thru the streets of Atlanta within 24 hours. Starz is great, the app is not! I love having Starz. The movies are a much better variety than HBO. However, the APP continues to stop and shut down randomly while watching a movie on my iPad. I even did all my updates for the newer versions of software on the ipad and then updated the app. Still fives mins into a movie today, screen goes totally black. Can’t even see anything on the app. Have to exit out of it, find the movie in search again, and start over. VERY ANNOYING! Wow...what a great movie for these times. Instead of division and hate it shows what can happen when people band together to help each other instead of hate each other. Should be watched in every church next Sunday. Many churches have themselves become fountains of hate instead of houses of faith. This show is so amazing I love the way they tell each story and just bring it to life like no other I tell all my friends they need to watch this show!!!!!! I have had STARZ for about a year. I have very rarely used it. I tried to cancel it last fall. Didn’t work. I called support to cancel it. They told me they could not cancel it, but I could at STARZ.com. It is ridiculous how difficult they make it to unsubscribe. I have been paying 8.99 plus tax every month for absolutely nothing. This app is crazy slow! Not only does it take forever to load but when I download a movie or show and then go to replay it later, all I get is a black screen. I love a couple of the shows but I can’t get them to play. What’s the point of this app if I can’t use it? So frustrating. I decided to download the app to watch the White Princess before the Spanish Princess starts. First, I resent being a paying STARZ cable subscriber and having to watch this on an app. I would think you could have it On Demand like all your other original series when leading up to the next season. But I suffered through using the app. It doesn’t work on my tablet. When downloading app it says not optimized for this this device, so the video won’t playback, even tho the device is less than 2 years old. So I watched on my little iphone. Had continuous problems with logging in, taking ages to load, and cutting off several times through the play back. Awful experience. So we can add movies/shows to our “playlist” (ie queue) but the app has no easy access to this...??!? Not being about to filter by genre other than the basics that they provide is horrible. And with the ones they do provide, there are a limited number of movies to sift through. Can’t sign in with my tv provider? I pay extra money for my cable service to have these premium channels and they don’t let you sign in with xfinity? What kind of crap is that? The movies could be better but the original series are why I subscribed especially OUTLANDER. I support STARZ primarily to fund shows like OUTLANDER 5 stars for every aspect of this amazing show. That is also why I continue my subscription during the HUGE hiatus between seasons. Constantly crashes or freezes. The 10 second skip feature only skips 6 seconds. Nothing has been fixed I still can’t hit play on the app. Is this a joke? STARZ just randomly started blocking dishes access to 95 percent of the reasonably good content. I literally use this app for two shows POWER and AMERICAN GODS. This is just a poorly run company. Dear sir: I am looking for the apps called stars, I like it a lot keep up the good work put more good movie special Baywatch I like the movie a lot. been tryin to cancel the subscription. it wont let me cancel. doesnt even pop up on my "subscriptions". emailed and called starz, 30 minute wait just to try and talk to someone. whats up?!?!? I used to love the app but now there’s some sort of glitch and can’t even log in. I subscribe through my cable company and the when I try to log on I select through cable provider and get a pop up about ok’ing adobe and still can’t log on. Adobe? Really? All I want is to be able to get back into the app again. It seems that every time I open this app something goes south. This time, it refuses to play or download American Gods, Episode 201. I deleted the app, reloaded it, logged in with my tv provider, and got the same result. I have an iPad Pro, it works beautifully. Why pay for frustration? I just downloaded the STARZ app on my phone so I could activate the app on my Samsung TV. Tried to play an episode on my TV. It took forever to load, then started playing without a picture, The picture showed up for a second before promptly booting me out. I rebooted my TV as instructed on Samsung help, but continued to have the same problem. Tried to download the app on my iPad and when I opened the app it says “stream overload, four devices at one time is the max. please stop playback on an active device and try again.” I only have the app on the TV, my phone, and now the iPad. That is three devices. None of which are playing anything! Very frustrating. I was excited to start watching my series tonight. Thank goodness it’s a free trial. I will not waste my money on this app. What is it with this app? I have much the same problem as another reviewer using Apple TV and Starz. Today it refused to play a movie at all telling me that I had four devices running simultaneously. The same movie played fine the day before. Although I had downloaded at High res, the screen was pixelated most of the time. I don’t have this issue with Tubi and Apple TV. I downloaded the app to watch “Outlanders.” It was quick to download, easy to sign in through my local cable provider and I’ve enjoyed several episodes without any problems. I am so frustrated with this app. I get frequent playback errors and the app stalls- alot. I have called customer support multiple times and have gone through all the steps-force close the app, switch wifi, uninstall and reinstall the app, etc etc. But a few minutes later I still can't play the content. I have the latest version of ios on my ipad, I checked to see if there is a Starz update available- I have tried everything. I even check to see if my internet is working by going to google or whatever, and Netflix/Amazon prime load and play content just fine. I hate the Starz app, it's complete garbage. I am cancelling and seeing if I get better luck going through Amazon Prime. 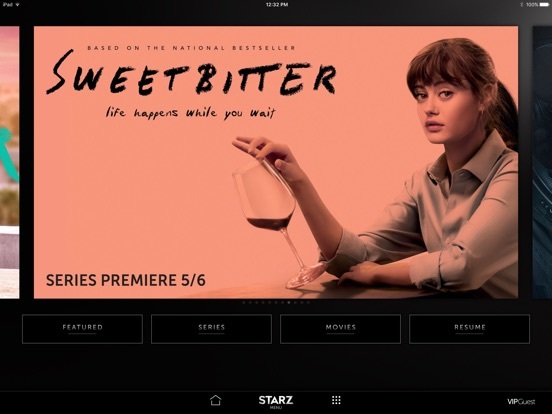 Using this app and watching specifically its most popular show American Gods, I’ve come to realize that there is so much more at play than a media company. Do they produce quality entertainment? Yes, the lighting, camera angles, filters, and CG are all very well done. The acting on some accounts was a little lacking, but that’s forgivable. What struck me the most however is the continued push against Christianity. All Gods are made out to be real, except for Jesus. All religious afterlife’s are real, except for Heaven and Hell in the Christian Faith. Continual mocks and slurs are made against Jesus and against Christians who believe in “fairy tales” and “nonsense” and are continually shown in a sinister light as though being a Christian in and of itself makes you an evil person. And the people who believed in the ancient Egyptian god Anubis are seen as rewarded and cherished as though they followed the truth. I am a Christian, and so I doubt that my review will be received without the same criticism that is dealt to Christians in the show. I was also greatly disturbed by the poor portrayal of white Americans. And the continual continual portrayal of the “poor and downtrodden” black community. They compare slaves of the past to the blacks today. They say that they have it just as hard, or that blacks are somehow suppressed in modern days due to their skin color. Leaving emotions aside, if the statistics are read and due research made, it’s very clear that no one is any longer judged by the color of their skin so much as the content of their character. If a black person decides to embody the persona of a underprivileged American, he will act upon those those beliefs. Blaming his circumstances on the “privileged whites” or “upper class”. 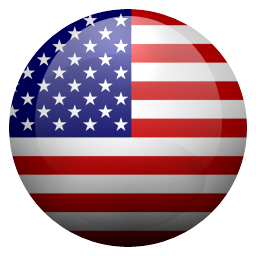 If one embodies the identity of true American ideology, they will act accordingly. That anyone can achieve anything, bc this is the land of the free. We are free to change our circumstances. We are free to pull ourselves out of the mud. We are free to do everything as we please, so long as we abide by the law. The idea that any one person cannot change their situation is not only degrading to that class, but it borders on the dangerous ideology of racism. Dividing people according to race and color. Choosing whites over blacks, either with jobs acceptances or school acceptances or house loans etc is wrong. That is undeniable. But to go in the opposite direction and demand that people offer certain privileges to certain classes because their skin is black or dark is also wrong. And it’s degrading. To give a black a lower entrance score into a school is degrading. To say that a black man rarely can afford to buy a house because of his position is degrading. And to promote on television to thousands of Americans everywhere that you cannot do anything, you cannot change anything, you cannot rise up because of the color of your skin is degrading and it is morally wrong. I am upset, not angry, but deeply saddened by how much this show pretends to champion the “minorities” and yet it strives so hard to solidify their position in society so they cannot and will not rise above. America is the land of the free, the land of opportunity, and if this kind of racism and religious hate continues, I am sorry to see where our country is headed. God bless America, and God have mercy on our souls. Love it...I’m a big critic about show/apps. STARZ has been on the best! Love watching Outlander through this verses the directTV app. As others have noted, the app hangs and crashes, even though I have the latest updates for ipad, and the app is the current version. I've tried deleting and reinstalling, but it still doesn't work. This makes the app impossible to use. I don’t have this issue with other streaming services. Fix this please. App opens very slowly, then finally allows you to navigate but won’t download or watch movies or shows. Just locks up the screen on three different iPhones, iPads and Firestick. When signing in through DirecTv, sends you into endless loop of logging in. Close login screen and you are logged in even though it repeatedly says your subscription is not found. But shows you are logged in. All the other apps we use seem to work fine, STARZ only allows you to see what they have but won’t let you watch anything. Doesn’t appear to be hardware issue, subscription works on satellite also. Just not on the app. 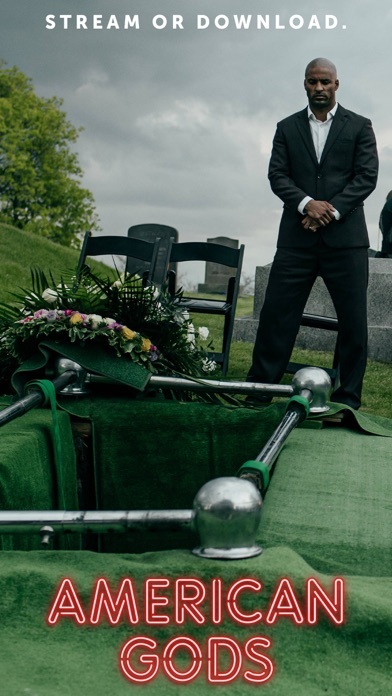 I have been unable to play the new episode of American gods that aired Sunday, every time I click on the play button nothing happens. The xbox app freezes and doesn’t open, and now this version doesn’t work properly either. You’d think STARZ would’ve hired better developers. I’ve had STARZ through ATT for years and have continuously had issues with the app. For the past two days I have tried to log in (frustratingly) over and over again and it keeps taking me back to home screen, no logging in. Contacted STARZ directly and received a response saying that my ticket had been closed... but no solution was offered or provided. Will be cancelling my subscription since I am not able to use this! First, the app content is good. My issue/frustration is with the functionality of the app itself. My biggest pain point (and it’s a big one for me) is that the app times out quickly and the video closes, especially whenever my iPad screen times out. So, say I hit Pause on a video for more than a minute or two and/or step away from my iPad long enough for the screen to lock, when I return, I have to reopen STARZ, and re-navigate to the video I was watching from the STARZ home screen. This also occurs when I switch between apps. Whenever STARZ is temporarily moved to the background, I have to search all over again. This is the only app I’ve encountered that does this, making it especially noticeable. Also, other apps have the PIP “drawer” functionality where you can slide a video off screen and return to it. This is not the case in STARZ... the video disappears, and again, if it has been a significant amount of time, I have to re-navigate back. It’d be nice to have quicker access to the main menus, and to time out on the active content’s description screen (but keep the video window open if in PIP mode). The chemistry between Jamie and Claire is incredible. I enjoy watching all of the characters develop. We delight with Rupert, Angus, and Murtagh. I think John Bell is a fine, young actor with a promising future. Like others, I liked John Randall but not Black Jack Randall. I also understand why Sam and Catriona have won awards. Jamie puts his whole heart and soul into his role. Catriona is gorgeous, and Jamie is ever so handsome, charming, and debonair. In a way, they have both lost children. They lost Faith. Did not get to raise Brianna together, and now Jamie sees William, but can’t tell him who he really is. I am reading the books and certainly will continue watching the series. I like the music and am learning some history too. I don’t look forward to it ending. The author, directors, set and costume designers, the way they worked on Ian’s leg and Colum’s legs, camera operators, musical arrangers, and anyone else affiliated with Outlander can be extremely proud of their quality work. The series is addictive and mesmerizing. Love STARZ content but the app is the worst I’ve experienced for any streaming service, paid or not. -Sometimes buffering takes place mid-episode and takes several seconds despite having very high-speed internet. -Sound goes out periodically then resumes later in the episode, sometimes multiple times (sometimes for a second or two a time, sometimes for several minutes). I’ve been using the app for 3 days and it’s happened at least 3 times on different episodes. -Often an episode won’t play when highlighted from the series page, and the entire app freezes up. I have to exit and reopen the app then re-navigate, going to series, show, then selecting the episode from the relevant season and click through that way to “wake it up” instead of just selecting the most recently watched episode as soon as I open the app and resuming where I left off. -Sometimes when resuming an episode, it spins the timer wheel indefinitely no matter what or how many times I try (even restarting Apple TV) until I first select and play a different episode before returning to the one I actually wanted to watch. Again, having to find a way to “wake it up” from a freeze. Can’t believe there are this many issues with a paid premium channel app, it’s barely worth it to watch the content jumping through so many hoops to do so, and it certainly doesn’t encourage me to continue a subscription beyond the trial. STARZ app is awesome in so many aspects. It has TONS of great movies and a nice selection of very well done and unique series such as Attila and The White Queen. It's also the easiest to navigate by far of almost every app on my phone I use to view movies on. They have quite the selection for the money and it's something I don't see ever canceling unless things go downhill but I've had this subscription a good couple of years now or near enough. I can't recommend how good it is with something for everyone, including the children. With this price point I often wondered why I ever bothered with some of my other subscriptions but they all seem to have something to offer that's unique but if I could only have my pick of two or three, STARZ would definitely be in my top 3. They have 2-3 standout series right now, but when you’re binging a show, they have a forced ad for their other content that u can’t fast forward through. They’re the same 3 ads, they’re all for shows and movies that are 10-15 yrs old. Anytime u watch a bts extra feature that’s 4 mins long, you have to watch a forced ad for the first minute. Let ME search your app and find your content instead of shoving it down my throat. Even though I love power and outlander the ads are almost more than I can take. None of my other subscription services inflict these in this way, in this quantity. The 60 second one that’s playing right now has graphic horror movies featured and I dont watch that kind of content bc it scares me. So bc I can’t ff I have to avert my eyes from my own tv for the 30 seconds that it’s playing. When I’m forced to have it on my screen before every episode that plays almost??? It’s too much. If they don’t stop soon, I’ll be cancelling my service. I subscribed to STARZ to watch Black Sails after catching the first few episodes on Netflix overseas and got hooked. I loved this show. I love pirates and Treasure Island was one of my favorite books as a young boy. I was a bit disappointed this show only has 4 seasons, but it ended well. Definitely not Disney pirates. I plan to keep the app to evaluate for a bit. I have heard good things about some of the other series. I hope I find more shows as binge-worthy. The app itself works very well and I rarely had issues except with occasionally losing my place when moving devices, but this is a minor grievance and it worked well enough most of the time. I will continue to subscribe at least a few more months if I find some other series on here that I like. I enjoyed it while it lasted! I called about getting a refund from my HBO NOW app and when going through the process on my phone i was told to go to billing in my settings. There i was showed everything i paid for. During this process my phone froze up and i accidentally pushed resend (resend funds) to another app being STARZ. I haven’t used my STARZ app since power went off (due to me always working) so i sent an email letting them know it was an accident and if i could have my money back. I got a call today and when the young lady was helping me she told me that i could only get one complimentary refund. I just want to know what type of mess was that when i was a customer for MONTHS! It is fine i will never redownload STARZ again. It is just absurd that i can’t get my money back over an accident. It was only $8.99 but it was MY $8.99 that i accidentally sent. I see how they make so much money because they don’t give people their money back even if it was an accident. Beautifully done! I’m amazed how so many of the original story lines have been twisted around to fit the screen. I am pleased with the selection of the characters in the story. In my imagination I pictured the characters a little different but as the story continues I can’t imagine anyone else having the ability to portray Jamie and Claire as does Catriona and Sam! Very pleased to be watching this series and Bravo to Diana Gabaldon because although I’ve always been entranced by the the stories of the Highlanders, ( from Karen Marie Moning too), I never knew the history of the Scotts and the history that followed the battle of Culloden. The service of indentured soldiers and bondsmen were a mystery to me. I have a greater appreciation of History as the story unfolds. Thank you STARZ! The app worked fine but when it came time to cancel, it became a nightmare. The app didn’t show up in iTunes as a subscription, so couldn’t cancel the way their instructions said to. Tried to login on the website, but on the iPad, the site forces you to open the app. The app says cancel on iTunes or on website. This was a maddening circle until I was finally able to login to the site via a computer. When I clicked the link to cancel, it kept prompting me to keep trying the service and cancel the cancellation, which, I believe, is purposely worded to confuse someone into canceling the cancellation rather than canceling the service. Tried to cancel before the free trial expired but since it wasn’t on my list of subscriptions in iTunes, thought I wouldn’t be billed. Don’t be fooled like I was. If you want to cancel, make sure you find the right link on the website, don’t assume you won’t be billed just cause the app doesn’t appear in iTunes. On a whim I signed up for a free trial to watch only 2 movies and be done with it. Empahsis on FREE TRIAL. The app itself was bad because it never worked properly but again, I needed to watch 2 things on a whim and be done with it. For free. After I was done, ended my free trial, and deleted the apps, I was still charged by STARZ, now monthly. Going on their website on my ipad, iphone, and laptop and following their instructing on how to deleted my suppose free trial, but because it was a free trial NONE of my devices seem to recognise the subscription and I cannot delete anything, file a report on apple, or even get decent help and explanation on why I supposedly now have a monthly paid subscription AND while the "cancel subscription" button is mysteriously gone from all three of my devices on my account. I want help and I don't want to pay for STARZ anymore when it was never meant to be my intention to be a subscribed member. I've read and reread Diana Gabaldon's Outlander series of books since they were first published in the early 90's. Initially I was curious as to how close the STARZ series would come to them. While the books hold more detail, this series is EXCELLENT! The selection of the cast, the work of the crew, the writing of the scripts and the direction is superior. I also enjoy the discussions at the end if each episode. I continue to reread the books and rewatch the previous seasons before each season and I am never disappointed. I'm not a purist, in that every utterance in the book is captured on screen - that’s impossible. So thank you for such brilliant interpretation and entertainment. Third time I've watched this show, but still missing a lot of episodes, thru my own fault!!! I absolutely LOVE these types of shows. When Kirk Douglas acted in the role, he did not know our History, very well!!! It was like I lost interest in watching more of bad rotten like sequels!!! Andy was wonderful as Spartacus, and it was so sad to see him and assume that he was in a dangerous fight of his own personal life. I'm sure all the other fans felt and still feel the sorrow of his demise!!! Thank you for reading my feelings in this first Spartacus and assume that he was coming back at the beginning of this great movie!!! I'm not sure of the new Spartacus, and how he will fill wonderful,l Andy's shoes or make that sandals. Well, that's about all I can say on this movie and the new actor that has taken Andy's place. Thank you for your attention on reading this and of Andy taking care of his failing, and keep this program going on. Thanks again, Nick Donvito, a true FAN!!!😎😎😎😇😇😇🚔🚔🚔🚓🚓🚓👮👮👮!!! I hope al the sequels do very well also!!! Good night (or morning) and I'm so glad to see so many other fans!!! I just rewatched the first four episodes of season three. The writers are to be applauded; you had a difficult task capturing all of the most heart-wrenching and important parts of Diana’s outstanding novels. To all of the actors, BRAVO! I sat mesmerized and almost in tears at the end of each episode. You have truly done an amazing job bringing this story to the screen. to all of the crew, directors, and everyone involved in the making of this most excellent production, my utmost gratitude. You have given the Outlander fans quite a treat. and hopefully, new viewers will delight in this story as well. Forge on in the making of upcoming episodes and know that you are all truly appreciated! Sue Schelvan, Huntington Beach, Ca. I have read all the Outlander books as they were written. I was so excited when they made the series. I read them when first published, so I got new copies and read them again to catch up on what happens when. The series is very close to the books. I could not wait to see Fergus and Ian grown up. I told my sister and daughter in law what a good series it was and we have been watching together. I can hardly wait for each week to pass to watch it play out. Such a wonderful blend of history, romance, drama and science fiction. I keep wishing there would be a book 9. Thanks for doing such a wonderful job being true to these iconic characters. The Apple TV app is a mixed bag: Most if it works fine, except when it doesn’t. In that past week I’ve run into two bugs: 1. More frequent: App becomes completely unresponsive to user input; only fixed after force-quitting the app — perhaps multiple times. 2. Only happened once thus far: The audio for the show I was watching earlier resumed playing as soon as I reentered (foregrounded) the app, despite the app not actually being on the player screen. When I went back to the player screen and resumed it from the user interface, the audio that had been playing previously kept playing at the same time as (and out-of-sync with) the correct audio for the playhead at which I had resumed the video via the UI. 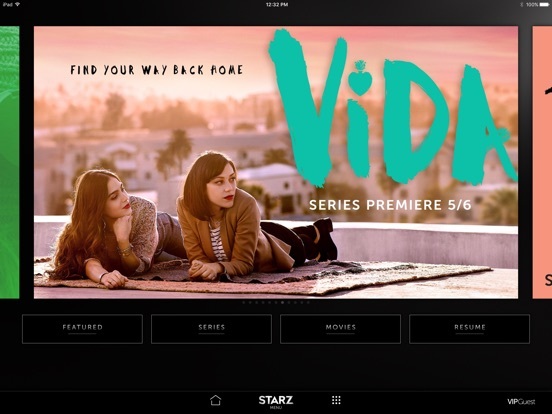 Starz: Please fix your tvOS app!!! Who made your application?!! A 7-year-old?! Ok I love the content that STARZ offers, if ONLY the app worked good enough to WATCH CONTENT! Every single time I go into the STARZ app on my Apple device I have to log in to my cable provider. EVERY TIME. And NOW it will only play about a minute worth of what I’m watching before it logs me back out AGAIN. I’ve always had similar issues with STARZ and I feel like whoever makes apps that WORK for other networks that’s what STARZ needs to do! They are making money but their application is beyond subpar. I’m disgusted from going through this time after time and I usually don’t bother writing bad reviews but this is how frustrated this makes me. It makes me not want anything to do with STARZ. Get ur crap together! I had starz before and never had an issue. I canceled my subscription when I ran out of things to watch. Now there’s new content I want to watch so I tried to renew through the app. It let me log in and I assumed everything was fine... for three days now I’ve been trying to watch movies and ever time I click play I get a renew subscription alert. So, I click it. It pulls up the disclaimer saying is 8.99 a month, I click renew again. The screen goes back to the movies, I click a movie and play again and go through all of it again. I received an email from apple saying that I’m now being billed again. So I know it should be accessible. I’ve tried closing out the app and reopening, no effect. I’ve updated the app and closed it, no effect. I’ve deleted the app and re installed, no effect. What’s the deal starz? I have both the STARZ and HBO now apps. 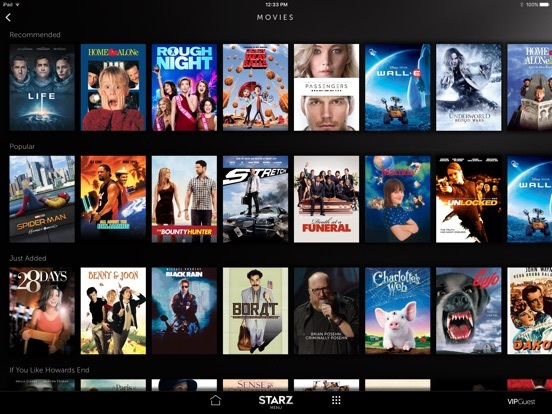 STARZ allows you to download many movies and shows from series so that when I am on a plane, traveling as passenger in a car or elsewhere, or just having WiFi issues, I can still watch my downloaded movies or series without issue. I’d be so much happier if HBO now offeredthe same. On top of that, STARZ has a good mix of oldies but goodies (from the 80’s and 90’s) as well as new releases. It’s also under $10 per month, where HBO now is $15. STARZ has been great, I never have issues with it in my apple iPad mini v 2 AND 4, and no issues on my iPhones. Highly recommend. I cannot seem to log in. I signed up for the free trial, but when I went to log in I got a warning about a token. Since I figured I would want to watch outlander anyways, I went ahead and signed up for 1 month thinking it was an issue with the trial. It still didn’t work. When I tried to say change password, it said that it doesn’t recognize my email address, but I cannot get to the screen to set up a new account. I have uninstalled and reinstalled the app, cancelled and reapplied the subscription and basically tried everything I can think of the clear up this glitch. I recently downloaded the new iOS, so I don’t know if that could be the issue... anyways, if this can’t be cleared up I hope I will be refunded as I have not benefited from this service at all. 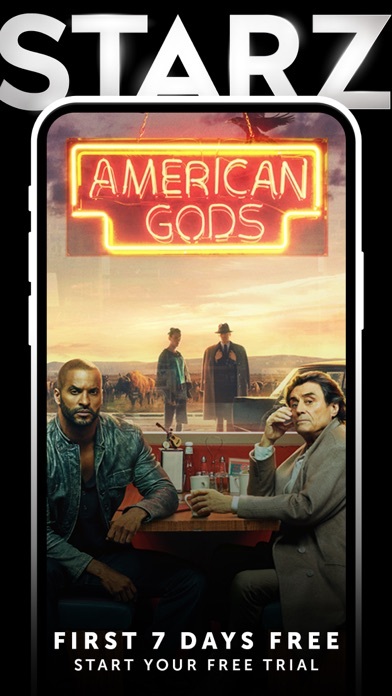 I purchased the app to watch American Gods, which I love! I've now discovered other original shows by Starz, like the pirate drama Black Sails, that I'm looking forward to getting into. White Queen is next with a little trip down Memory Lane in the form of Good Times and Sanford and Son after that. Did you know they have vintage TV shows on this app? They do. 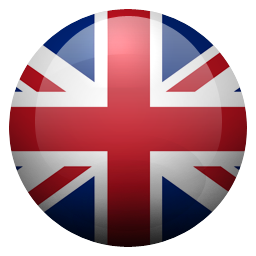 The app itself is easy to use with a beautiful and intuitive user interface. Their equivalent of the hourglass and spinning rainbow disc is a lovely and neat little graphic. Okay, back to Black Sails. Starz, what do you think about adding Chico and the Man? I own and have the books since I bought the first one at a 7-11 in the late eighties. The books transport one to a beautiful love story with an entirely engaging plot. When I learned of the series on STARZ I eagerly anticipated each season. Though some details are changed ( Mistress Abernathy/ Geillis was a fat momma on the island in the book) most of my favorite scenes are spot on. I am a Visual Art Specialist/ artist and the visuals ( scenery , costumes, sets) are stunningly beautiful in each episode. I applaud the work especially of the actors who bring Claire and Jamie to life. Kudos to you all . So when will Season Four air, please? 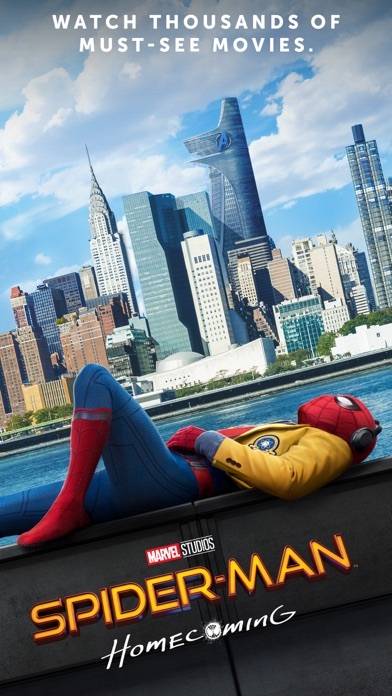 This was an awesome movie it was awesome but sad all at the same time. Because now and days people go through these types of things in life. And some people that’s going through stuff times hard trials and etc need to watch this movie to uplift themselves not only to uplift themselves but this movie should be able to motivate them to do the right thing for there loved ones. So I would like to say great good to the actors that’s in this movie and to the produce who made the movie well done you all did an excellent good and deserve an Oscar award for this movie. I logged in with ease and so far I’ve had no issue watching or finding the shows I want to watch. It is easy to pick and choose which episode of Outlander I want to watch and it’s easy to navigate through the app. I also love that I can choose to skip 10 secs ahead rather than just manually skipping through the episode. It lets me skip the intro and recap easily and it doesn’t take me forever to see the actual show. I haven’t had a single ad or anything and I’m really happy with the app as a whole. Power is the bomb even tho I feel they have ghosts tangled up in too much to come out of this mess that’s created , every single person on the show has beef against him the girl from the beginning. Tate , taressi. Stein tommy low key Angela Tasha Silva Jason Dre. It’s to unbelievable. Something has to give faithful watchers will get frustrated I did. But ! on the flip 50 is a genius he has many talents! and has a hand in other things continued blessings to him I’m very proud of him. Yahweh bless and keep you Mr Curtis Jackson. P.s I would like to see tryeek end up being his son on the show. EDIT: This issue is fixed now. 5 stars. My main intended use of the app is to download shows to watch on flights. When it shows my list of downloads the app interrupts itself to show me the “hey there’s no network” message. If I click really quickly I can get my show to start but then the full screen pop up comes a split second later and no more show. Fix the network notification; if I can watch downloads offline the one star will go up. Starz shows are fantastic. I love Black Sails and Outlander. But the app is terrible. It works okay if I’m streaming over LTE, but it will not consistently connect to Google Chromecast. Sometimes it will connect and a show or movie will play, but then it glitches. The show will keep playing on the television but the app freezes. I’m still not sure how this works because sometimes it will continue to play after I’ve closed all my apps. This may not seem like a problem except there is no way to pause or rewind a show once this has happened. It also won’t download shows. The percentage complete will go to 99% then jump back down to a much lower completion % over and over. Loved the app, but sign in issues with latest update. Version 3.10.1 introduces mandatory email attribution to sign in. I don’t like it, but fine. Next step seems to be prioritized for stand alone accounts, ok. I have service through Verizon FiOS, so I’m attempting to use those credentials. Unfortunately, login fails on iPad Pro and iPhone XS Max at verification. Confirmed with two separate FiOS accounts. All was fine yesterday before the update. I hope this gets sorted out soon. 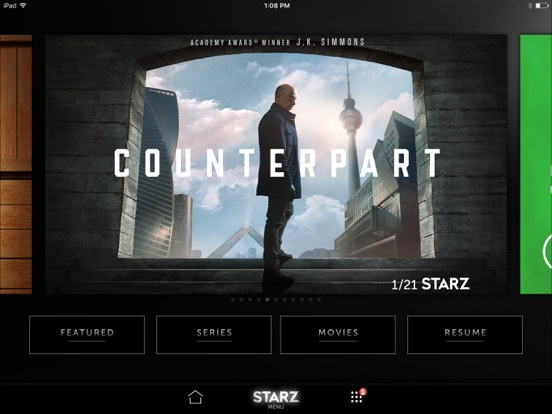 Aside from other occasional login problems that are usually resolved by deleting and reinstalling the app and the time out issue raised in other reviews, the STARZ app is solid. I’ll give it 4 stars when login bugs are worked out. 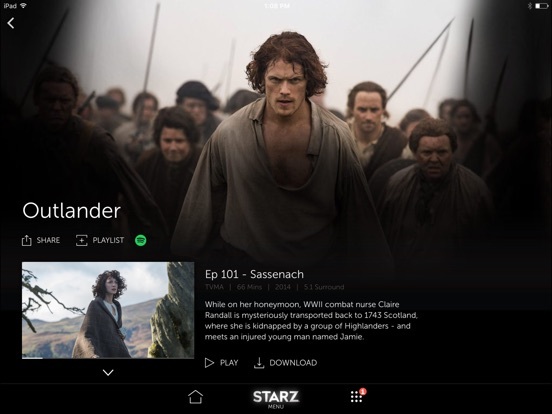 I set up a subscription with starz and love the app! Unfortunately I had to change my Apple ID email and the app doesn’t recognize me anymore. I tried to restore my purchase through iTunes several times and I keep getting a message that my account isn’t valid. I contacted apple and starz because I’m not sure who needs to fix what. I’m currently still waiting to hear back from both. It seems like it should be a simple fix but it’s taking a long time. This is frustrating when you use it every day. I subscribe to stars and have been able to watch it on my phone on my little screen but have been very unhappy watching it on my television. Very slow in downloading and now also wishes for me to upgrade on my TV and won’t allow me to watch anymore Of the series on my TV. 30 minute wait time at least when I had to set it up to receive it on my TV where I’m already paying for it. Too much hassle. I’ll finish my series and cancel my account. Was excited to try the Starz App to watch the new season of Outlander, but taking advantage of my 7-day Free Trial has been frustrating. I entered an email and attempted to create a password, but when I tried to submit this information nothing happened. Now, when I bring up the App it asks if I want to login or start a free trial. When I click on free trial it says that there is a problem with my account and I need to login. However, I don't have login credentials so I can't access the app at all. I sent the notification that I received from starz confirming my free trial to their Help Desk but received only an automated reply with instructions on how to cancel my trial. I wrote back to them yesterday asking for help but have yet to receive a response. I am a reader of the books first and have loved Starz and Ron Moore’s production of Outlander. Every episode of every season to date has been marvelous. The characters, places, events have been brought to the screen in such a wonderful manner. The actors, creators, designers, and all those involved in bringing Outlander to life have exceeded all my expectations. Great job everyone, I love you all for your hard work. There is nothing better and I appreciate how you have all worked to bring my favorite books to life on my tv. Thank you Starz! On episodes that have been downloaded there frequently is short periods of blurryness. Sometimes it's not all over the whole screen at one time. I think I like the former way the videos were placed on the page. I watch a lot on my iPad and if I happen to interrupt the show by hitting the home button it will not let me go back to my saved episodes I have to watch on a simultaneous download and viewing which can be slowed when others are using band width. Love that I get to see some of my favorite movies and interesting shows on here- but... seems like 80% of the time I’m having to close out and restart the app just so I can hit play again. Also it’d be nice to have my movie play where I last left off, instead of having to start from beginning and scroll to where I was. Was going to tolerate it. Rarely write reviews, but it’s too much now. Also sometimes when I download a movie it just doesn’t play. I have to delete and redownload. Another option that would be nice to have is playing stuff offline. I know it has that feature but again. Crash. Crashes crashes crashes. WON’T LET ME LOGIN : UPDATE! Used to be a great app. Has a glitch right now. Got logged out either through an update or some other reason. When choosing TV PROVIDERS the square in the middle just spins and then stops with NO TV PROVIDERS TO CHOOSE FROM. I’ve been a STARZ customer for YEARS. I’m sure this will work out and then I’ll give it the 5 stars it USED TO BE. Since I can’t get ANYTHING ON THE APP it should really be 0 STARZ. I haven’t tried the app on my Apple TV Yet. WORKS AGAIN! Quirky app now. NEVER HAD A PROBLEM WITH IT BEFORE. Gets its 5 STARZ BACK! Still have to check the Apple TV app. Please continue to bring Outlander I have been enjoying the past seasons and looking forward to season 4 and will be thrilled to see the entire series of Diana Gabaldons books brought to Starz. 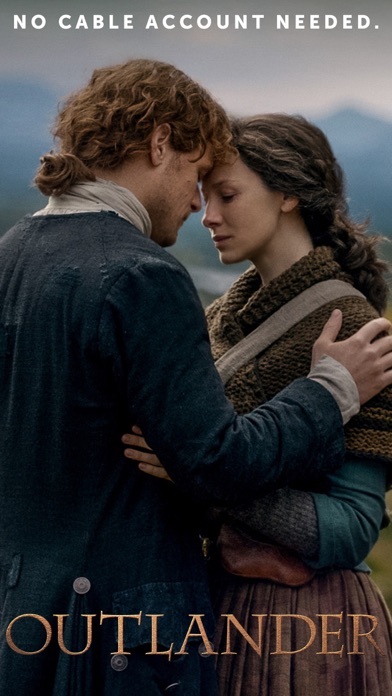 The Outlander series was my reason for subscribing to Starz originally I will continue for future seasons I want to see the entire story if Jamie and Claire lives with the promise of book 9 & 10 we have a long way to go. I re-read the books and re-watch each season. This is Entertainment at it's finest!! Do you love waiting 10 minutes for something to load and then fiddling around to fix the constant glitches every single time you reopen the app or pause the movie? Yes? Then this will be the perfect app for you :) And uh yeah my wifi clocks at 12 mbps, perfectly fine, so don’t blame it on that plz :))) yeah no the app is just plenty glitchy! Doesn’t play the first time you click—have to click in and out to get it to start. If you pause for a while or click out to use a different app, you have to wait or sometimes restart the app to continue. If you finish a video it will not register as finished (or even accurately remember where you left off). so don’t play y’all know it’s nice and glitchy! I work in overnight security so having an app where I can watch movies and original series is great during down times. There is usually a larger enough selection that I can find new and interesting content daily. 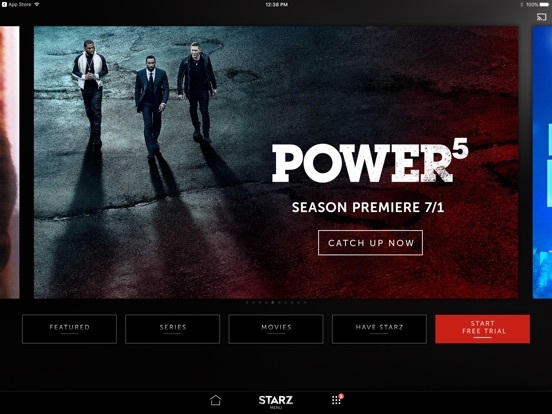 The reason I downloaded the app was because I cancelled cable to go with internet streaming services but still wanted to watch power the original series which I love. 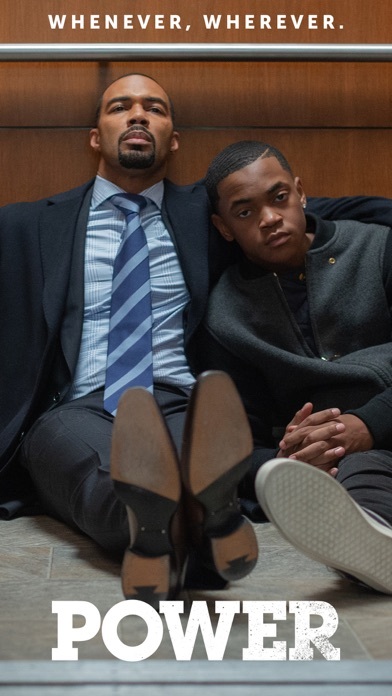 Power is is the real reason i stick with STARZ and haven’t jumped to Netflix.